A pimple on the lip area can be both embarrassing and painful. When it occurs, individuals may try to mask the appearance of it by using lipsticks. You may try to use foundation if it is just off to the side of your lips. In most situations, this will only make the situation worsen and even lead to further inflammation of the area. It is a good idea to take actions to deal with this condition. Acne here can spread and it can become painful if it breaks open. To avoid the onset, it helps to understand what is causing these to occur in the first place. The lips are very sensitive parts of the body's skin. Both pimples and cold sores can develop in this area. However, these two conditions, which are sometimes mistaken for each other, can have very different causes. A cold sore is often an open sore - with red, inflamed tissue that looks like a scab has just been torn off. On the other hand, a pimple is a single spot where a raised dot is located, often in a very localized, rounded fashion. If you have a pimple, the cause is far less worrisome than the virus that causes cold sores. A pimple on the lip area is often acne. This occurs when there is an over production of oils in the skin as well as the development of too many dead skin cells in the area. When this happens, the skin's pores become clogged. This leads to inflammation as the body's immune system works to clear the blockage. 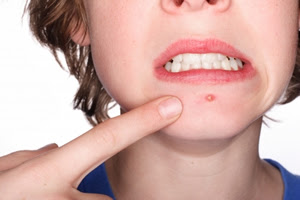 A pimple forms and over time, the bacteria are trapped and developing pus. If you are dealing with a pimple on the lip area, there are a few things to keep in mind. 1 - Avoid popping them open. You are simply releasing the bacteria onto the skin where it can be very difficult to remove. In short, you are infecting other areas of the skin. 2 - Do treat them but use an over the counter acne treatment designed for lips or at least for facial acne. You do not want to ingest this, though, so keep it out of your mouth. 3 - In many cases, you can clear away pimples in this location by simply improving the cleaning of the area. Ensure you use products to wash away makeup and other substances on the lips. Keep them drier, not overly oil. Be sure to clean the skin surrounding the lips to help remove the dead skin cells. Managing bacteria is the big concern when it comes to getting rid of the pimple on the lip area. The goal is not to break it open or to squeeze out the pus. Rather, it is best to allow the body's immune system to dissolve the bacteria and inflammation on its own. With the aid of a few acne treatments, you can increase the overall health of your skin and reduce the risk of developing new conditions.